Above, the intersection of South Ervay (at left, with cars headed north) and Jackson Street (at right, with pedestrians walking east), about 1946. All those little shops…. And look at that cool Sun Drop Lemonade ad painted on the Jackson Street side of the building! Below, that same corner today. Top photo from Jim Wheat’s Dallas County, Texas Archives. 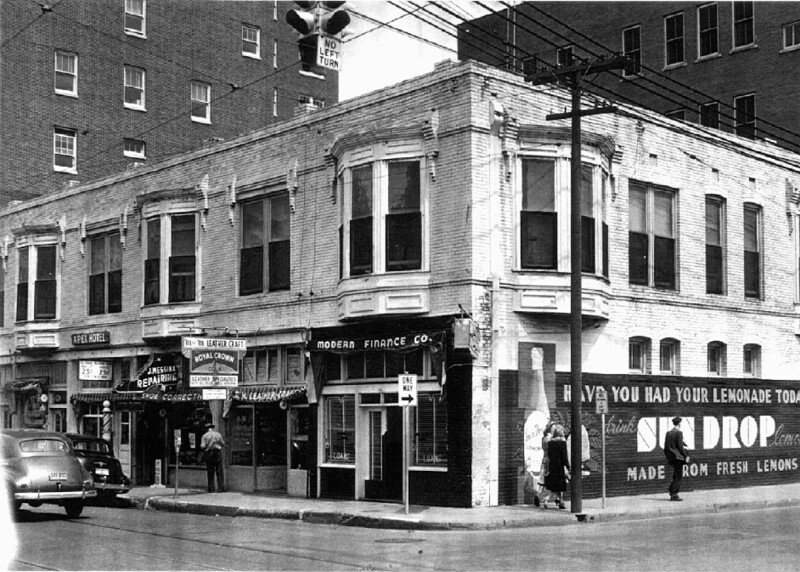 Wheat estimates the photo was taken around 1946, with the following businesses identified: Modern Finance Co., 204 S. Ervay; South Ervay Barber Shop, 208 S. Ervay; Apex Hotel (probably pretty dodgy, but who wouldn’t want to stay at the “Apex Hotel”! ), 208 1/2 S. Ervay; Perfect Hand Laundry & Dry Cleaning, 210 S. Ervay. “Today” photo from Google street view. 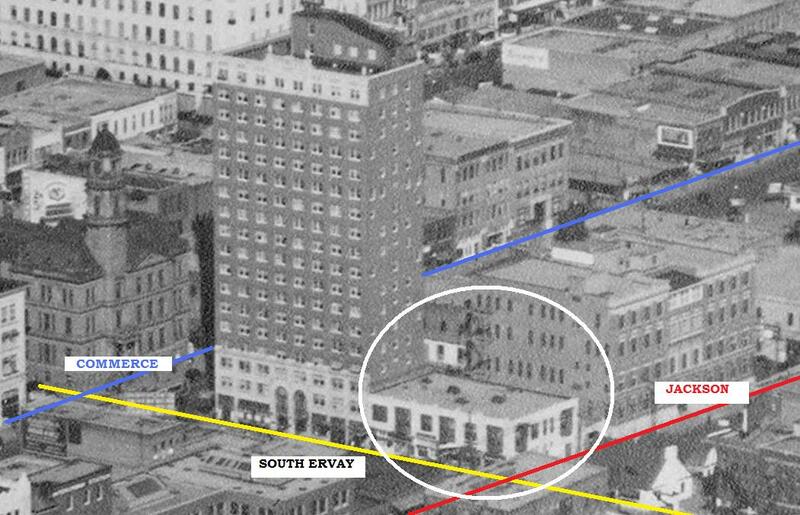 The last image is a detail from a 1935 aerial view of the “Mid-Town Business District,” taken by Lloyd M. Long; it is part of the Edwin J. Foscue Map Library, Central University Libraries, Southern Methodist University. SMU’s labeled version of this map can be seen here (the building in question is adjacent to the Allen Building, which on SMU’s map is #38, at the top right — use the zoom function to see all sorts of things!). 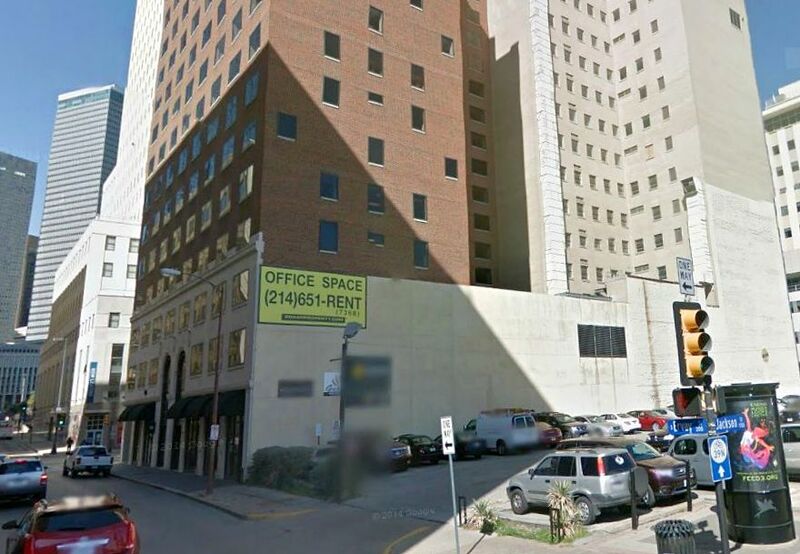 Folks who might might be curious about the west side of the 200 block of South Ervay can get some idea of it in the images found in the “There are eight million stories …” piece earlier in Flashback Dallas. These pics were made from the east side of Ervay at about its intersection with Main and show that portion of the street south of Neiman’s. The 200 block was built up in the late 1890’s, with the east side having construction of two stories, while the west side was of one story. Before this spate of building took place the block fronting on the east side of Ervay contained only a few residences, while the west side had a house or two, as well as a couple of Chinese laundries. The small shops on the west side of Ervay had even less pretension to style than those across the street, and various facelifts altered them more significantly than similar work on the east side, where at least the second floor facades retained their original appearance through the years. I first saw this emporium in the mid-1950s (by which time it had become Fred’s Place), and even then its appearance was very much in line with the popular conception of an American saloon. Perhaps the brass foot rail at the bar had been replaced by stools–or maybe not. I don’t know how much longer this and the other turn of the century buildings in the 200 block of South Ervay survived, but likely not much beyond the late 1950s. This is GREAT info, Bob! Thanks!